Jane and Lisbon are stepping towards their happy ending, but another serial killer might be the ultimate obstacle. Read on for our recap of the two hour Series Finale of The Mentalist, with the episodes “Brown Shag Carpet”, and “White Orchids”. Jane has finally clear in his mind what he would like his life to be. He bought the piece of land he discovered during the previous episode, and he wants to build a house for Lisbon and himself. with you, and I want it to represent our future…together. This speech represents basically 13 years of relationship. That tiny object, that ring, it brings within the past, the present, and the future. There’s the love that used to be, there’s death and pain in it, but there’s also hope, and life, and the need to be happy again. Lisbon will not only share that ring, but she will start wearing it in her necklace, next to her mom’s cross. This scene is probably one of the most important, beautiful scenes of these seven seasons. Lisbon says “yes”, she will be Jane’s wife. Much to Jane’s relief! The two start planning the wedding, going from low-key to big-party in no time. New boss Cho helps Lisbon find the right dress, and the two share a beautiful moment when Cho tells her that her mom would be very proud of her. But the big party style is not for Lisbon, nor for Jane. So the two decide to just get married in their new land, but Lazarus is still planning his revenge against Jane. He hiddens in the officiant’s car, so he manages to get to Jane’s cabin. But the FBI is waiting for him, and they arrest him before he can harm Jane or Lisbon. 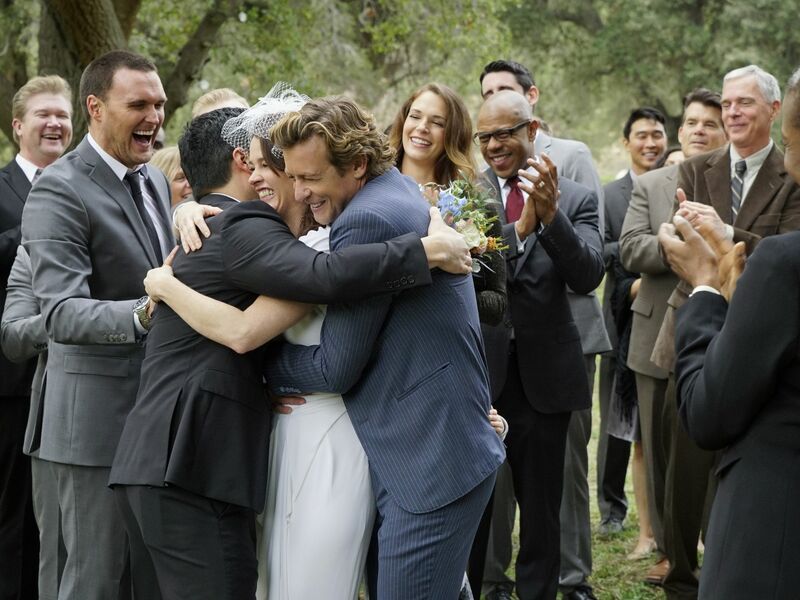 Jane and Lisbon can finally exchange their vows, in front of Lisbon’s brothers, Cho, Abbott, Wylie, Rigsby and Van Pelt who arrived to celebrate their former boss, even if Rigsby still calls Lisbon “boss”. After the ceremony’s over, and a big happy party is going on (with a lot of familiar faces from The Mentalist’s Crew), we get to witness another big moment, probably the most important. Lisbon is pregnant. There’s a baby Jane on the way home! The Mentalist started with a broken man who has lost his wife and his little child, his entire life is without a meaning, save to find the serial killer who had killed them, and get his revenge. But Jane couldn’t imagine that a tiny, strong woman was about to change his life. From partners, to friends, to something more, to husband and wife. It was an incredible journey, a path towards redemption and hope. Lisbon has always been the key. The only key that could lead Jane to explore this new path. Lisbon is light, love, she is his second chance in life. She’s not only giving him a future, but also a new life. Literally. Jane will be a dad again, never forgetting the past, never forgetting Angela and Charlotte, but with the hope for a bright future. The Series Finale ends with Jane holding Lisbon (and their baby) in his arms, in their new land, their new home. I personally couldn’t have hoped for a better end. I like positive, happy endings. I like when the characters are given a chance to happiness. I am happy for Jane, but also for Lisbon, who has finally found the love of her life, and who will be a wonderful, badass mom. Who wouldn’t want to have a super strong FBI agent as mom? I can already see a more domestic Jane, taking care and spoiling their baby while Lisbon is hard at work catching bad guys, probably with less dangerious field work, but still catching the bad guys; when she’s not home taking care of her little baby and her other “older baby”. This is how I want to imagine Jane and Lisbon, happy for the rest of their lives. Thank you all for reading my recaps. It has been a joy for me, and I’m going to miss writing them so, so much. As the Mentalist wraps up, I just wanted to thank you for all the time and dedication you have made to maintain this site and all the photos, recaps etc. I have loved this show for a long time and it is people like you… the ‘real fans’ that made it so enjoyable for people like me. I haven’t commented much but always read and enjoyed your thoughts and information I’d not seen before. Wishing you well in the future. And by the way I agree with you 100% that the finale of the show was all and more I could have hoped for! The Mentalist will always be my special Show, and I’m glad I could make it show via my recaps. It was a special finale, one I’m sure it was done to say thank you to all the dedicated fans. I really agree with Jessica. Thank you so much for your recaps and everything, for all your time and effort. I’ve only recently found the time to catch up with all the episodes/season 7. But since I first stumbled apon this site, I’ve made it a habit to read your entries after each and every episode. Especially if your native language isn’t English, it is sometimes hard to get the fine details, which you helped me to discover in several cases. So thank you again and all the best from Germany.